This week is the end of summer. From Monday we revert to Winter operating so flying on Thursday through Sunday and the office Friday through Monday. If the weather looks stunning and we can get a winch driver and instructor then we will blog in advance. EVV will be out of action for a while, Simon Adlard is in charge of the restitution and we are chasing up the final registration with LUV so we will have a K23 available. Sunday: Guy Hartland, Geoff Dailey,Glyn Macarthur. Once again, we are offering the Mynd Bonfire extravaganza with a lovely bonfire, fireworks and mulled wine followed by a fabulous meal. For this event to succeed we do need members to confirm they will be coming and will be willing to pay £10 a head for the fireworks. Please can you email or call the office to confirm this. If you haven’t been before then I can assure you it is a magical night, the top of the Mynd is a special place to be on a crisp November evening. Christmas dinner only a few places left!!!! This will be on the 9th of December. I do urge you to get your name down early, there were several very disappointed people last year as the numbers have to be limited. November 25 will be the members evening when the committee will present our strategy for the next 5 years and invite your input and approval. January 13 – National Trust. All of your questions answered (who does own the horses?) and the trust’s plans for the future development of the Mynd. February 24 – Julian has very kindly offered to talk about Euro Glide with us. More details closer to the time but I can assure you it is absolutely brilliant and will inspire you. March 10 – Hugh Browning the BGA safety wizard. Once again we are able to offer a first aid course to interested parties see the poster below. Let Mark know directly if you wish to attend. Many of you have been asking after Dave and we all hope him a speedy recovery. I’m sure he will be hopping about as soon as he can (sorry Dave, couldn’t resist it). ‘How to get high without drugs’ – a talk by Phil and Diana on wave soaring, aimed at everyone, from those who have done little or no wave flying, to those who have some wave experience, but would like to learn more or have a refresher. Choosing a glider and how syndicates work’ – by Rose and Iain. 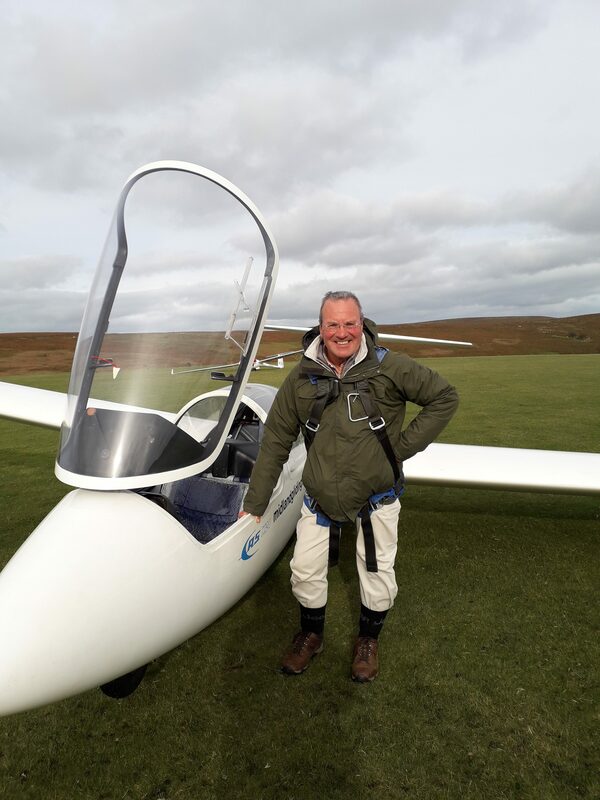 Advice for members looking to buy their first private glider, covering suitable gliders to choose and effective ways to organise a syndicate. Venue: Bateman Arms in Shobdon village. Timings: 7 p.m. to 9.30 p.m.
Martin, he resoloed after more years than he cares to remember! Well, not quite as forecast! The cloudbase was lower in the morning, there was more rain, there was less wave but apart from that brilliant. Hi everyone, this is the regular Thursday posting to let you know what is coming up in the near future and the highlights of last week’s committee meeting. The final bit of paperwork has now gone to the CAA so LUV will be ready to fly as soon as the weight of the paperwork exceeds the weight of the glider. It should be in the next couple of weeks. At this point I think it is worthwhile reminding everyone that we now have 2 pairs of similar aircraft and it is ESSENTIAL that they are logged separately. Please do not write K13 or K23 in the logbook, use the trigraph instead. This is a legal requirement. You will probably have seen the MGC events calendar on our web site. Thanks to Geoff Minshull for organising this for us. The 23rd to the 27th will be half term juniors week, ably run by Paul Fowler so get your name down quickly. Call or email the office. Christmas dinner only 12 places left!!!! Air traffic control are coming – attendees get the opportunity to visit Air traffic. The first one will be the 21st of October and the deputy watch manager from Birmingham’s Air traffic will be coming along to fly, talk and have a meal with us. I cannot over emphasise the importance of us understanding Air traffic’s needs and using every opportunity to communicate ours to them. As an extremely generous gesture he has offered to reciprocate. So turn up to the talk and put your name down for a visit to Birmingham ATC. I have been before, twice, and I can thoroughly recommend it, they really do make you feel welcome and at last you can see what the Balls on the Clee do! Courses and accommodation prices: we will leave course prices as they are and increase rooms to be more equitable with the surrounding area. The course guarantee will be reworded to still offer a benefit but remove events beyond our control. Marketing: The Ocktoberfest was excellent see previous blog. MT and winching: there is white smoke from one of the main winches, to be investigated urgently. Finance: the cashflow demands the sale of the Discus to replace the cost of the K23. Buildings: Rob Shepherd has elicited the ideas for the old MT and workshop. An agreed set of requirements to be created to evaluate the ideas against. Grounds: The South end footpath diversion is complete except for some additional signs. In a word, GOOD. a WSW 15/20 knts, good wind profile, an inversion sub 3000′ and an approaching front (more of a major weather event) this all adds up to wave. That is bad news for Saturday, but with any luck, a breezy/bungy day on Sunday with a wavey profile but the inversion is higher at 6000′ which is not so good. If for no other reason you could come and if we don’t fly I can explain why a high inversion is not so good as a lower one. Oh, by the way there should be plenty of pairs of hands as the North Hill mob are here again. Tuesday was good, short west with wave (Rob got up to 9000′ https://www.bgaladder.co.uk/dscore.asp?FlightID=68706&RC=X) plus when the ridge died and the paragliders were landing ,we, the chairman of the LMSC or Nick as we call him, and myself went ridge running, 8knts or so and we didn’t need the trailer!! Hi everyone, this is the regular Thursday posting to let you know what is coming up in the near future. Sunday: Simon Adlard, Stephen Alexander, Liz Adlard. Oktoberfest took place last weekend in Shrewsbury. This was a massive project for us and we really appreciate the efforts of everyone involved, both beforehand to pull it all together over the space of 3 weeks(! ), those who worked on the stand during the event, and now as we follow up. There were 10,000 visitors, we spoke to hundreds of them and now have over 50 people to call who are very interested in what our club has to offer. The results will flow through as we follow up and keep in touch with these interested folks, and I would be very surprised if we don’t end up with at least 4 or 5 new pilots joining our happy throng, just as a result of this one event! The response so far to requests for volunteers to work on road repairs has been disappointing. Without a concerted effort the road surface will continue to deteriorate and we will soon find ourselves back where we were last winter. It is unreasonable to rely on the efforts of individual club members, so we need to put together a team of people who are willing to give up just a few hours on either a week day or a weekend to help out. If you are prepared to help, please put your name on the list in the clubhouse or contact the office and let Martin know. The first one will be the 21st of October and the deputy watch manager from Birmingham’s Air traffic will be coming along to fly, talk and have a meal with us. I cannot over emphasise the importance of us understanding Air traffic’s needs and using every opportunity to communicate ours to them. As an extremely generous gesture he has offered to reciprocate. So turn up to the talk and put your name down for a visit to Birmingham ATC . I have been before, twice, and I can thoroughly recommend it, they really do make you feel welcome and at last you can see what the Balls on the Clee do! I seem to have got out of the habit of blogging, but a good westerly week with wave is worth sharing. I have been running a half course and it has been one of the best October weeks I can remember. The ridge has worked every day so far with good wave on two days, Tuesday and Thursday. Two flights into wave today, the first began to peter out at 9400’amsl and the second time we broke off in 4knts at 11900’amsl!!! Wednesday, Kevin Burns, a visiting pilot managed 4hrs35 of his 5hrs duration on the worst day of the week shot down by deteriorating weather . If I can retrieve some photos from my P2’s phone I will retrofit them to this blog. This photo is from the first wave flight which didn’t get so high. 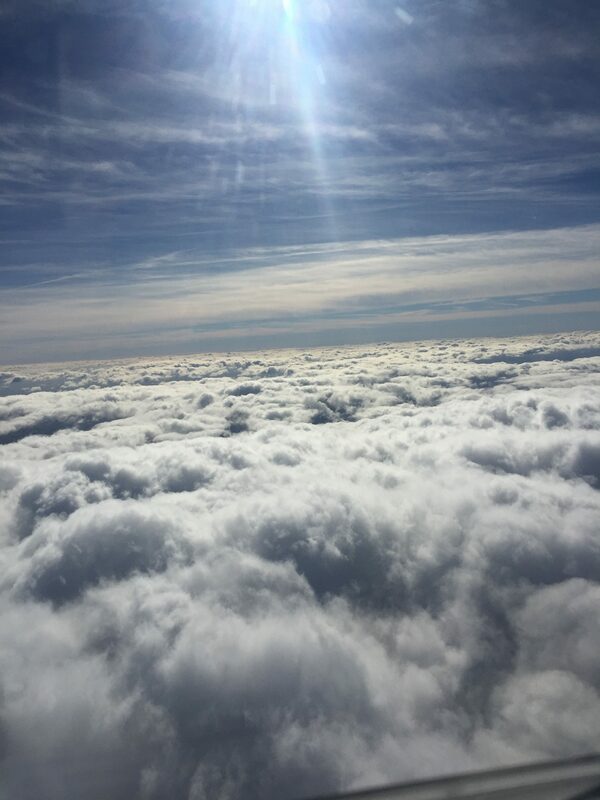 The BGA view is that the default categorisation for airspace is class G. We recognise that commercial air transport may need the level of protection that is currently provided through controlled airspace. You’ll be aware that the BGA does not oppose proposed airspace changes that in its view are reasonable and proportionate. Unfortunately, UK airspace policy and the airspace change process is heavily tilted in favour of commercial operators. Within that process, responses from organisations such as BGA, LAA and others are usually considered as a single responses, which frequently leads to misrepresentation of the level of opposition when airspace sponsors submit their proposals to the regulator. It is really helpful if individual pilots carefully consider airspace change proposals that affect them and respond individually. This greatly supports centrally organised response efforts, which continue apace and which greatly benefit from significant effort and expertise from a number of individuals at clubs. Please may I request that as club chairman you encourage your club’s involvement with relevant ACP’s and in particular please encourage your individual club members to respond to those ACP’s. This is a slight change from the past where we only encouraged mass involvement with specific ACP’s. We know its yet another burden, but these are challenging times. Or it may also suit someone who is interested in learning the art of design (training will be given). All reasonable out of pocket expenses will of course be refunded. If you are interested in finding out more or have any questions, please email me (chairman@midlandgliding.club) or Sarah (marketing@midlandgliding.club or 07754070357). Taster Day a roaring success! This year’s Taster Day in June was a real success story, thanks in no small part to everyone involved who made it happen. We achieved everything we set out to do and you can find out more about what we achieved by clicking here. Bear in mind too, that we hope to see even more benefits in terms of positive PR, new members and new returnees feeding through, as the attendees’ first 3-month memberships start coming to an end over the upcoming weeks and months. You may be aware that we have begun to take a new approach to marketing the club. There is a move away from only having trial lessons to offer people, towards having more products available for people who really want to learn to fly and perhaps become members too. This is a massive project, and the first steps have been to go back to first principles and design products that we hope potential members will be interested in. As part of this we want to be seeing more people face to face and having conversations with them, so we are attending a range of shows and events locally, the first being OktoberFest in Shrewsbury this weekend. If you’re there, do pop in and say hello. If you’re one of the team helping on the stand, a massive thanks in advance. We will learn from this and use what works to make the next event even better. 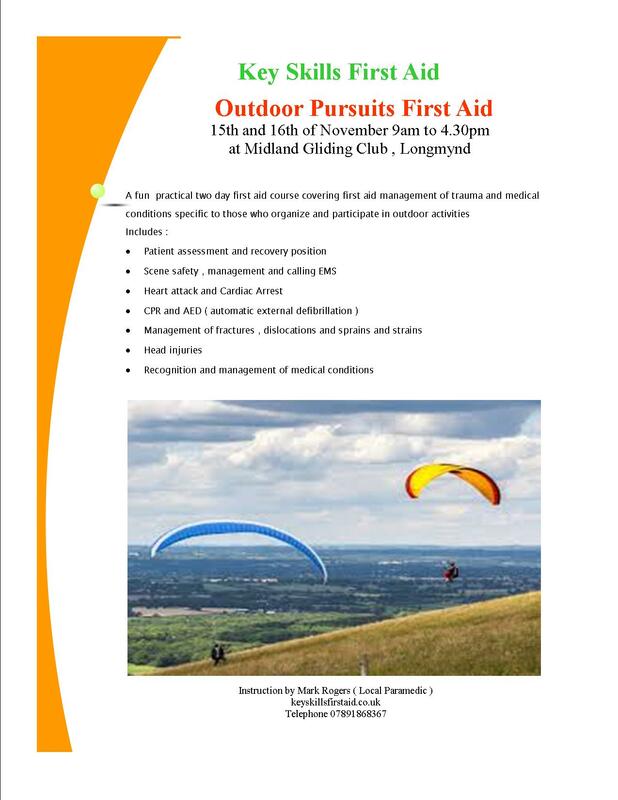 If you have any questions on any of this, or indeed you may be able to offer your expertise in this area, then please contact Sarah (marketing@midlandgliding.club). On the 7th of October we will once again welcome the classic car rally. They will arrive, have a cup of tea, relax and then head off again. They are a stunning sight and we welcome them every year. Iin return they take our leaflets and distribute them far and wide for us to aid recruitment. They expect to arrive between 10 and 11.